Arbitration and mediation are alternative dispute resolution (ADR) techniques available for many types of litigated matters, including divorce. Couples who are filing for divorce can opt for mediation or arbitration to resolve their issues as opposed to the courtroom. Before you agree to any type of ADR, it’s important to understand the difference between arbitration and mediation. 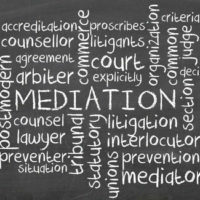 A mediation is where parties to a lawsuit meet with a neutral third party who acts as the mediator. The mediator is a private party hired by the spouses to help them reach an agreement they both can live with. The mediator is a neutral third party who has no vested interest in either side. He or she has the purpose of finding out what both spouses want to get out of the divorce as it relates to topics such as child custody, child support, alimony, asset distribution, etc. A mediation can take place over one session, or it may require multiple meetings with a mediator. Mediation can be a great option for couples who want to avoid a long drawn out court battle and are open to resolving their issues quickly and fairly. Both parties have to be open to compromise for a mediation to be successful. The big downside to a mediation is that if there is no resolution reached, the divorce will have to be litigated anyway. An arbitration is similar to a mediation, except the presiding neutral third party renders a decision. An arbitration is overseen by the arbitrator, who is granted the ultimate decision-making authority when deciding on a case’s outcome. The agreement is binding in court, and there may be an option to appeal in some limited cases. Arbitrations are less formal than a trial, and the rules of evidence may be more relaxed. Both sides will agree to terms and rules before the arbitration begins. Arbitrations typically move faster than a divorce heard in court. This means you can, in some cases, wrap up your divorce significantly faster than waiting for a court date. There are some divorces where almost all the issues are resolved, except for one or two. Having an arbitrator decide the only remaining issues can save you money as well since your attorneys won’t have to keep appearing for court hearings. It’s important to select an ADR professional who has experience with divorce mediations or arbitrations. They should be familiar with Florida matrimonial laws as well. Remember that your mediator or arbitrator cannot give you legal advice, so individual questions should be directed to your respective Florida divorce attorneys. One of the biggest pros about ADR options relates to privacy. Unlike trials and court proceedings, the information is not entered into record, so your private information is preserved in a trial transcript that cannot be obtained by members of the public. Some people feel more comfortable opening up about private issues in a mediation rather than on the court record. Some people might feel like their feelings or legal rights are pushed aside in some ADR hearings. Another potential negative can be the other side’s attorney discovering weaknesses in your case that can be exploited at trial. If you have questions about alternative dispute resolution or looking to file for divorce in Florida, contact the Law Offices of Schwartz | White at 561-391-9943.